When you study characters closely, you will be able to make inferences and to build theories about them! Theories are ideas that you have about the character based on the evidence that you see in the text. When you make a theory about a character, it should be based on multiple pieces of evidence (not just one instance). 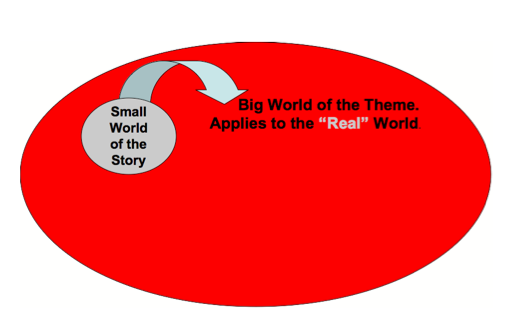 Here are some examples of theories, using the story "Inside Out" by Francisco Jimenez. The protagonist (main character) in the book is named Francisco. When you are reading a text closely and analytically, you are almost like an undercover detective trying to spy on the main character (the protagonist) or like a scientist who is trying to learn about a creature by observing them. When you read, you must look closely at even the smallest details in order to develop a full and complex understanding of the protagonist. You can easily remember these things by remembering the acronym WALTRR! "I dressed in...a flannel checkered shirt, which Mamá had bought at the Goodwill store." "Papá had already left to look for work..."
"...unlike our tent, it had wooden floors, electric lights, and heat." Franciso and his family don't have a lot of money; they are poor. Conflict is a problem that characters face. In novels, characters can experience internal conflict and/or external conflict. Internal conflict is when the problem is inside the character’s head. It is when the character is battling against himself or herself. Pay attention to how the character reacts or responds to the conflict. (Remember, this is one of the R's in WALTRR!) This can tell you a lot about a person! "When my head began to hurt, I let my mind wander." "I preferred to hang around Arthur, one of the boys who knew a little Spanish." "Often during recess I stayed with the caterpillar." I think this shows that Francisco is passive. He just lets things happen to him and he seems to be OK with being alone. Theme is one of the five literary elements. It is the message or lesson that the author wants to show or tell readers. It is NOT just one word. - Are not explicit (clearly stated). - Are implied, which means that you will need to INFER, or MAKE CONCLUSIONS in order to figure it out. - Are bigger than the story. - What is an important idea that comes up in the story/novel? - What does the author believe about that idea? The answers to these questions will often give you a hint about what the theme of the story is! These can also be used as evidence to support your ideas! - The conflict is that the monkey can't get his hand out of the cookie jar. - The problem is not resolved because he didn't want to let go of the two cookies. - There is a negative consequence: he remains stuck and begins to cry. - Don't take more than you need. In the book/story ________________________, the author shows that _____________________. This is shown when _____________________________________. I think that ______________________. This is because _____________________. In the story "Inside Out," the author shows that Francisco and his family don't have a lot of money. This is shown when Francisco gets dressed in a shirt that "Mama had bought at Goodwill," which is a thrift store. Maybe they can't afford to buy new clothes for him. Francisco also says that "Papa had already left to LOOK for work," which means that he currently doesn't have a job. Lastly, when he sees the classroom for the first time, he says that it had wooden floors, electric lights, and heat, "unlike our tent." This means that he must live in pretty bad conditions. His home doesn't have lights or heat, which might make it uncomfortable for him sometimes. At first, Francisco doesn’t really respond or react much to his conflicts. He daydreams in class and he just stays inside during recess with the caterpillar instead of trying to make other friends. I think this shows that Francisco is passive. He just lets things happen to him and he seems to be OK with being alone. But, I think that Francisco is going to change because, when he was fighting with Curtis, Francisco says, “I knew I had no chance, but I stubbornly held on to my jacket.” This shows that he is beginning to fight back a little and that he is trying to stand up to what he thinks is right instead of just accepting things. This makes me think that, later in the story, Francisco will begin to be more active in trying to fix his problems. Maybe he will try to learn English and make other friends.